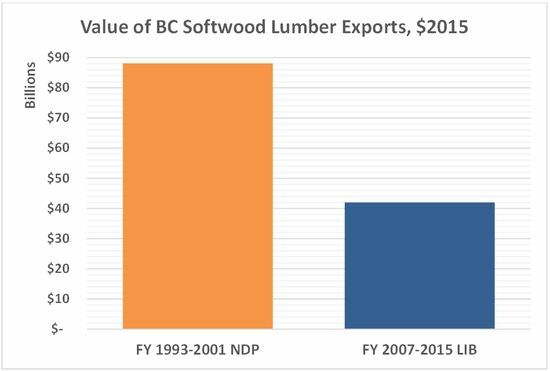 These graphs are drawn from softwood lumber exports data published by BC Stats. My aim is to compare results in recent years to those from the desperate nineties when wild-eyed anti-business socialists governed British Columbia. The NDP administered BC for nine complete fiscal years, April 1992 to March 2001. I have compared that period to the nine most recent fiscal years of the current Liberal government, April 2006 to March 2015. "This is great news for British Columbians who depend on the forest sector for jobs that support their families." "I was shocked," Bell said. "I had to do the math three or four times to make sure that I was right." He credits the expansion to work by the province and forest industry to diversify the market for B.C. forest products by expanding into China. "This is the result of years of hard work by the provincial government and industry," Bell said. 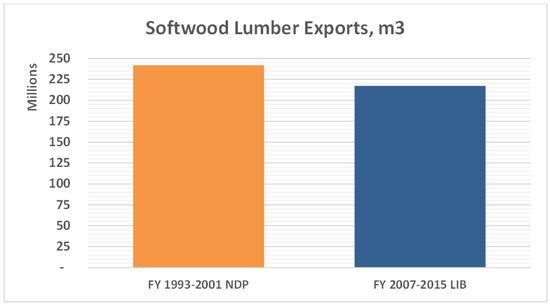 Despite expensive marketing efforts in new regions, softwood lumber exports dropped 25 million cubic metres in the more recent period. However, the truly shocking news is that the value of exports, measured in 2015 dollars, is $46 billion less in the period of Liberal rule. There is a clear explanation: the unit value (price per cubic metre) of exported lumber dropped significantly. There are a number of potential factors behind these results. 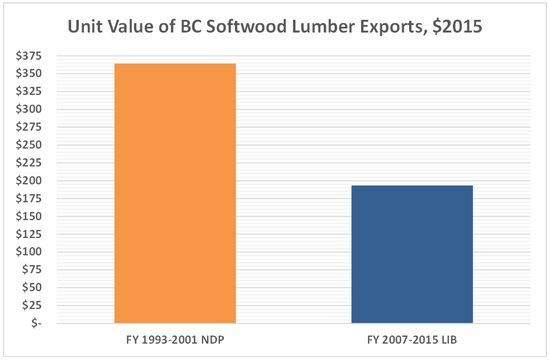 It is possible that BC sawmill products have declined in quality, perhaps because high grade timber is now exported in the form of raw logs, although the unit value of logs shipped overseas has declined by a similar percentage. One bothersome possibility is fraudulent transfer pricing. In modern times, sales of materials seldom involve a direct connection between producer and distributor and when international transactions are involved, the layers become even more complicated. Physical goods may travel directly but ownership might move in a convoluted path, sometimes passing through offshore tax havens. Liberal policy has been to reduce the number of public servants in all parts of government. As a result, the ranks of professional employees have been decimated and, in this more complicated globalized economy, the province has far less ability to ensure fair dealings in production and sales of its natural resources. How much of the billions of dollars of lost trade resulted in lost wages and lost taxes? Clearly, the impact is huge. I cannot explain why the profile of forestry trade has shifted and I fear the BC government cannot explain it either. There's one difference though: I'd like to see it clarified, the Liberal Party and their corporate sponsors are quite happy with the way things are. Briony Penn has written a piece in Focus Online on how concerned BC citizens have been doing the job that the Forestry Practices Board should be doing but can't due to cutbacks and being understaffed. Surprised. No, shocked. I couldn't believe these numbers until I checked them myself. Why is this not headline news on television, radio and newspapers? Anon: I suspect it isn't headline news because no self-respecting "professional" reporter is going to be seen quoting an "amateur" blogger — despite the veracity of the latter's work. So, the former will have to check out all the source data to prove its veracity… or just hope for a big fire or a five-car collision to report on instead. I suspect this "fraudulent transfer pricing" scheme will be used in BC's Liquified Fractured Gas industry, it will insure a zero profit and therefore zero taxes paid in BC. You may be absolutely correct. When a BC company manufactures a product and sells it at arm's length to consumers or a domestic distribution network, valuation and taxation is relatively straight forward. That will not be the case with LNG exports where deals are not at all transparent. When participants have a record of unethical acts, the certainty of tax fraud rises significantly, particularly when if the taxing authority has little willingness to enforce its own laws against companies being used for political gain. I've watched a parade of logging trucks heading down Vancouver Island roads but we no longer see the number of mills and lumber trucks that were once common. Old W.A.C. Bennett must be spinning in his grave to imagine that BC trees are now providing work to people in China. Love him or hate him, he new that public resources should be used to create jobs in British Columbia. Thanks for your work on this and other subjects. How can readers help get this information to others? I am astounded by these numbers and others would be too if they saw the numbers and heard the explanations. Thank you Brian. To some extent, numbers speak for themselves so it is a matter of getting them circulated. If readers forward this link to others and add it to comment pages on other news sites, the information will be read more widely. "As you know, the Vancouver Province is an official partner of Resource Works, who are essentially the public relations arm of Woodfibre LNG. "That means, of course, that the Vancouver Sun and the National Post, also wholly owned by Postmedia, are partners as well. Essentially, they are as much a part of the proposed operation as Woodfibre LNG itself is. "The National Post is on the record approving of the aims of the Canadian Association of Petroleum Producers (CAPP). "We must therefor assume that when it comes to the extraction, transport, refining and shipping of fossil fuel products that Postmedia will be biased strongly in favour of industry and their bought and paid for governments and this will not only manifest itself in editorial opinions but also in the presentation or non-presentation on the news stories. "...This places on all of us a duty to inform everyone that we can what is happening on the fossil fuel/pipeline/LNG front. We must use the “Social Media” to a fare-the-well. I believe that we can do this much in the way they used to do chain letters..."
This may not be related to logs but is so relevant to what you, Norm, have been preaching for some time. I take no credit for this piece other than some copy and paste. Three photo ops. Three countries. Three scandals. July 8, 2015 – Malaysian police raid offices of state-run investment fund: Malaysian police have raided the HQ of a state-controlled investment fund at the centre of a major corruption scandal engulfing the country’s embattled prime minister, Najib Razak (seen here with B.C. premier Christy Clark on May 5, 2014. Razak is facing mounting calls to resign after a Wall Street Journal report last week about debt-laden state fund 1Malaysia Development Bhd (1MDB) alleged that nearly $700m (£456m) went into his (personal) bank accounts. In 2013, after being acquired by Malaysia's Crown corporation PETRONAS, Progress Energy donated $10,000 to the BC Liberal party. Pacific Northwest LNG, in which PETRONAS is the major shareholder, donated $4,950 to the BC Liberal Party last year ($0 to the BC NDP). July 3, 2015 – The prosecution Friday raided the headquarters of POSCO Group as part of its investigation into the alleged creation of slush funds and improper merger and acquisition (M&A) deals involving former and incumbent key officials of the firm, including ex-Chairman Chung Joon-yang (seen here with B.C. premier Christy Clark in May 2012. Investigators from the Seoul Central District Prosecutors' Office raided the company office in southern Seoul and seized computer files, account books, and documents concerning the firm's M&A deals. Between 2012 and 2013, POSCO Canada donated $1,150 to the BC Liberal party ($1,000 to the BC NDP). Asian Agri agrees to pay Rp 2.5 trillion fine in installments: A palm oil conglomerate found guilty of tax evasion in 2012, has agreed to pay Rp 2.5 trillion (US$204.8 million) in fines in a deal that will allow the company to pay the fine in installments. Asian Agri, which is owned by tycoon Sukanto Tanoto (seen here with B.C. premier Christy Clark in 2014. – Forbes magazine’s 10th richest person in the country with a net worth of $2.3 billion – is obliged to pay a fine of Rp 2.5 trillion or 200 percent of its tax obligation between 2002 and 2005. In 2014, Woodfibre LNG, owned by Sukanto Tanoto, donated $28,000 to the BC Liberal party ($8,000 to the BC NDP).